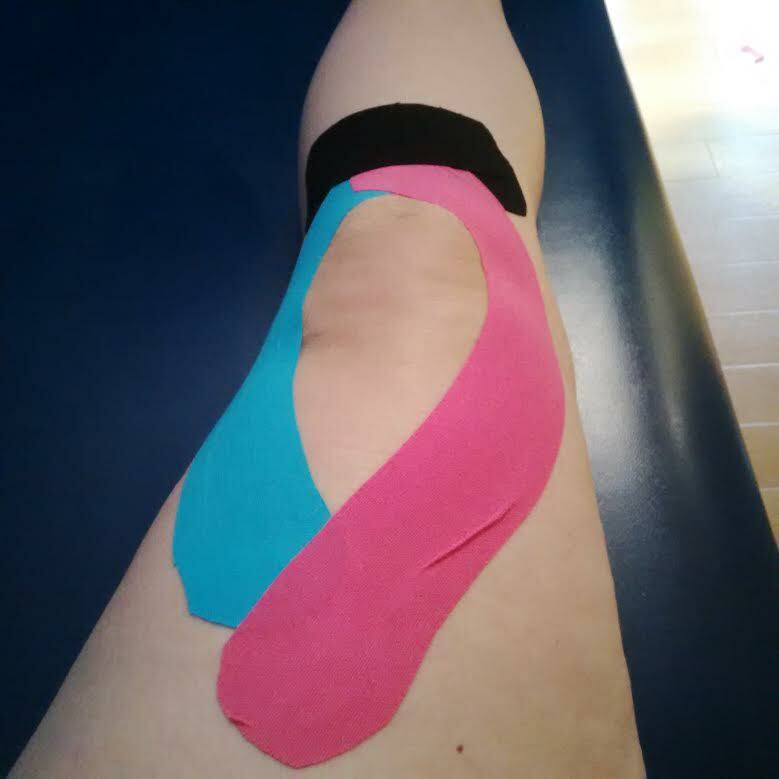 All taped up after my first physio appointment. On the morning of April 26th I woke up with an extremely sore left knee. I had been bowling in a bowl-a-thon a couple days earlier, and just thought I might of sprained it, so I didn't think much of it. I rested it, iced it and took Advil when needed. Some days it felt better than others, and I just assumed it would get better on its own. I saw my family doctor on May 12th regarding something else, but mentioned my knee. It was feeling pretty good that day, and after telling him about the bowling, and him moving it this way and that, he didn't seem too concerned either. Five days later I was in the Emergency Room. I was sent for X-rays, and the results even shocked me. I had a split knee cap. It was an old injury, really old, like 28 years old! I had been in a bad car accident in November 1988. I shattered my left femur bone, as well as other injures. When I woke up in the hospital way back when, no one told me about my knee, it was all about my femur bone. It makes sense that I would of injured my knee cap though, I was sitting in the front seat of the car, and I shattered my femur bone, so my knee would of taken the impact. I was sent home with stronger pain meds, advised to use a cane, and an appointment with a orthopedic surgeon. 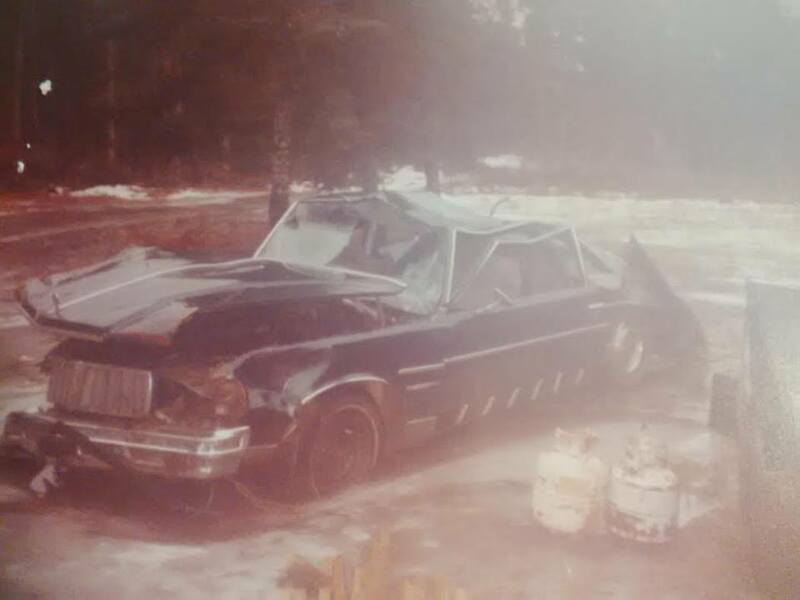 The car from the accident in November 1988. I had my first appointment with Dr. Nguyen on May 24th. I liked him immediately, and knew my knee was in good hands. We talked a bit about my X-rays, the accident and how my knee felt. A MRI was needed before a proper diagnosis could be given. Keep using the cane, keep resting it, icing it and pain medication when needed. I went for my MRI on July 12th and was diagnosed with osteoarthritis on my follow-up appointment July 26th. I was experiencing my first official "flare up". Before I continue, I need to say something. I realize that I have not been diagnosed with a life threatening illness, I get that. 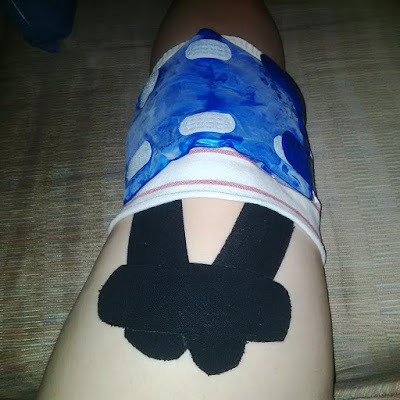 I use my blog as an online journal, and except for the little ray of sunshine, that was my niece's visit in July, the last 4 months have revolved around my knee. I have had a lot of thoughts tumbling around in my head for the last 4 months, and I need to write them down, so I can move forward. I do believe I've gone through the 5 stages of grief during the last 4 months. I was in denial when it first started. After I was diagnosed I was pissed off that something that happened so long ago was having such a huge impact on my life now. I don't know if I did much bargaining, except to think that Rob would have to start birding without me, and that sent me into a huge depression. I had many, many, "woe is me" days this summer, but I am starting to come around to the acceptance of it all. Icing my knee after physio. I've been going to physiotherapy weekly for a month now, at Dr. Nguyen's clinic, and will be an ongoing patient. What they do there and the exercises I do at home are helping. The Arthritis Society website has been a great resource. There are lots of things I can do to help manage my arthritis; I recently joined Good Life Fitness and am looking forward to starting aqua fit classes. I've increased my Omega 3 consumption and losing a few pounds will be beneficial too. There are times I will still need to use a cane, and a walking stick when going for birding walks is a good idea. I know the days of all day birding walks are probably over for me but any time in nature is better than none. The day may come where I will need a new knee cap or start getting Synvisc One injections, but I am not there yet. With proper care and maintenance I should be able to manage my arthritis. I recently got the go ahead to start moving more, and I am looking forward to enjoying some Fall walks with Rob. 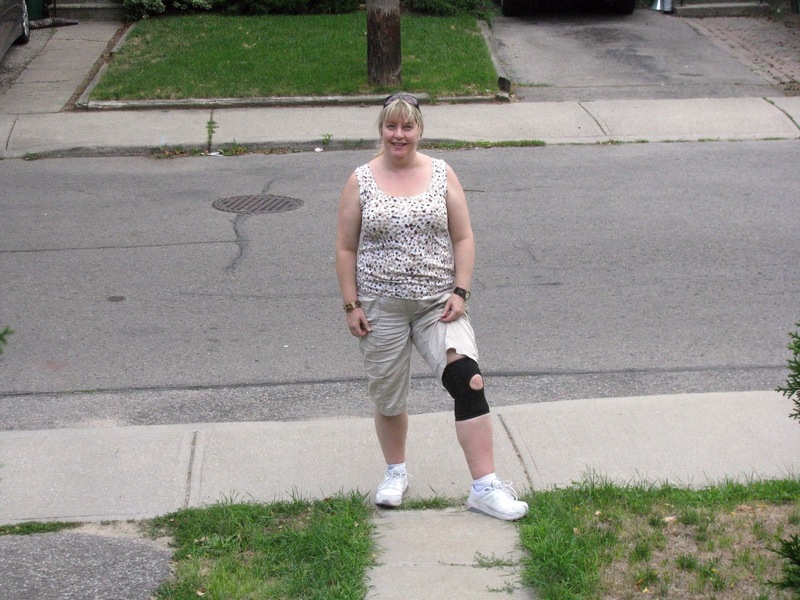 Showing off my knee brace after a short walk with the hubby! This diagnoses may of slowed me down, but I refuse to let it keep me from doing the things I love.